The combined experience of the Snowbee sea fishing product development team, totals more than 100 years, with much of that time spent fishing Channel wrecks out of Plymouth. Since the early days of modern wreck fishing, back in the 1970’s, we have seen gear and lures evolve to where they are today. During this time however, the Snowbee team have watched with interest, but always believed we could do better… and so, the Snowbee Stinger Skad is born! We have always felt that both the Sandeel and Shad patterns have their limitations, depending on what the fish are feeding on at the time. 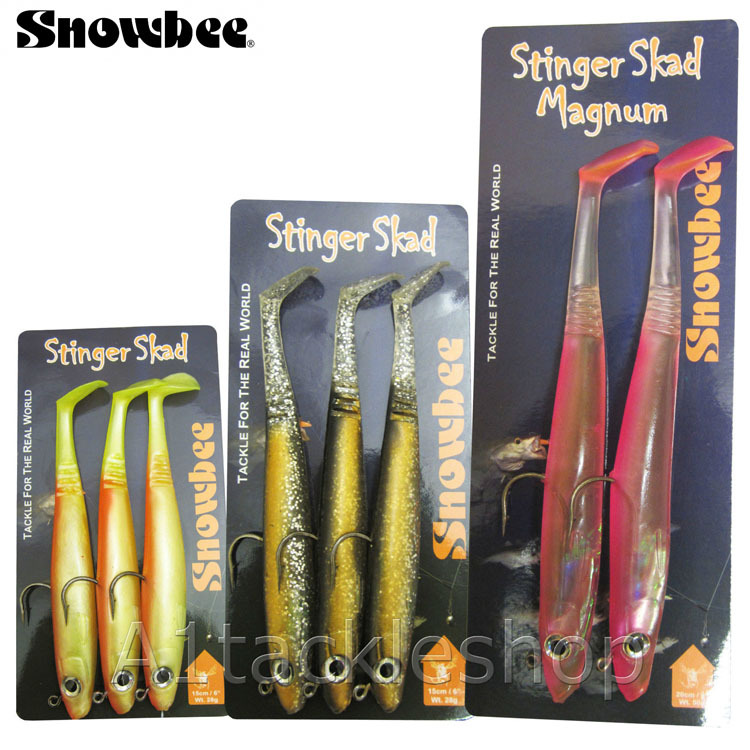 So, the new Skad lure is a hybrid of the two – heavier set than the Sandeel patterns, but not as heavy as the Shads. In this way, it cunningly imitates both and will fish effectively, when fish are feeding on either Sandeel, or small baitfish, such as Pout, Mackerel or Herring. The lifelike action of the Skad, is the result of years of research and testing, to create the perfect lure. Using a high grade, natural scent PVC material, resulted in a highly durable lure that will not tear apart, the first time a fish hits it. The highly elastic tail is able to ‘stretch’ when fish are ‘biting shy’, rather than snap-off, as has been the case with some lures. This new material is also unique, in that it is crystal clear, unlike many of our competitors, whose lures use an opaque material. The advantage of this clarity is a clear light reflection, off the outer surface, coupled with an enticing holographic shimmer, off the internal lead-weight foil wrap – a combination which any predatory fish finds irresistible. The tail has a series of moulded ‘slots’ down each side, while the oversized ‘paddle’ tail, is angled forward along the bottom edge. This combination not only creates an exaggerated tail action, even at very low speeds, but also sets up additional undersea noise – a proven fish attractor. Fitted with over-size, ultra-sharp hooks, to ensure fish stay hooked plus large, holographic eyes – a known ‘trigger point’ for any predatory fish. Available in three sizes and a range of amazing colours, the Skad can be fished on a traditional long flowing trace and boom, over reef or wrecks, for species such as Pollack, Cod and Ling, or used as a casting lure for inshore species such as Bass, Pollack, Mackerel etc. Either way, they are lethal fish catchers! On our first trip with the prototype samples, aboard the Snowbee ‘Deep Blue3’, just a single lure accounted for over a dozen fish, including Ling to nearly 20lbs. The lure? A little chewed up, as you’d expect, but quite capable of fishing again… and again!